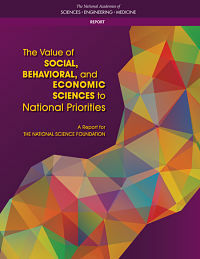 Copies of The Value of Social, Behavioral, and Economic Sciences to National Priorities: A Report for the National Science Foundation are available from the National Academies Press on the Internet at www.nap.edu or by calling 202-334-3313 or 1-800-624-6242. The social, behavioral, and economic (SBE) sciences make significant contributions to the National Science Foundation’s mission to advance health, prosperity and welfare, national defense, and progress in science, says a new report from the National Academies of Sciences, Engineering, and Medicine. NSF should undertake a systematic and transparent strategic planning process that defines SBE research priorities, the required resources, and how success in addressing SBE priorities will be evaluated over time. In addition, the understanding, tools, and methods provided by the SBE sciences — including research supported by the NSF — provide an essential foundation that helps other agencies achieve their missions, the report says. For example, NSF-supported research has provided valuable information about the patterns of behavior of hackers and the vulnerabilities of the nation’s cyber networks. These analyses served as the foundation for the development of tools and applications that contribute to military capability in current conflicts and the prevention of future conflicts, as well as to efforts to combat terrorism, which are central to the missions of the U.S. Department of Defense, intelligence agencies, and the U.S. Department of Homeland Security. John S. Carroll, the Gordon Kaufman Professor of Management at the Sloan School of Management at the Massachusetts Institute of Technology. Melissa K. Welch-Ross, a staff officer with e NAS directed the NAS working for the committee. The study was sponsored by the National Science Foundation. The National Academies of Sciences, Engineering, and Medicine are private, nonprofit institutions that provide independent, objective analysis and advice to the nation to solve complex problems and inform public policy decisions related to science, technology, and medicine. This entry was posted in Academic Funding, Public Policy and tagged National Academy, NSF, SBE Directorate. Bookmark the permalink. Post a comment or leave a trackback: Trackback URL.